That title may be a little deceiving...This isnt really a post about wallpaper info as much as it is about installing wallpaper. Wallpaper is it's own animal. It's major impact and we use it all the time but there is an art to being a wallpaper installer. Wallpaper isn't just slapping up some paper and calling it a day. There are many more steps to it and, to be honest, everyone could use a little bit of an education in wallpaper. It's just good to know what an installer has to go through, pretty much for anything, because it helps you appreciate their work much more and understand the value of their job. So here's the quick and dirty on wallpaper. For starters, walls are not always just ready for wallpaper. If walls have texture, they must be smoothed out or "skimmed" before wallpaper can be applied. There are certain instances where wallpaper can be used with a liner paper underneath it but this is only if the wall has a light orange peel texture. Any walls with heavy knock-down texture will need a separate drywall repairman to come in a skim the walls before wallpaper can be applied. 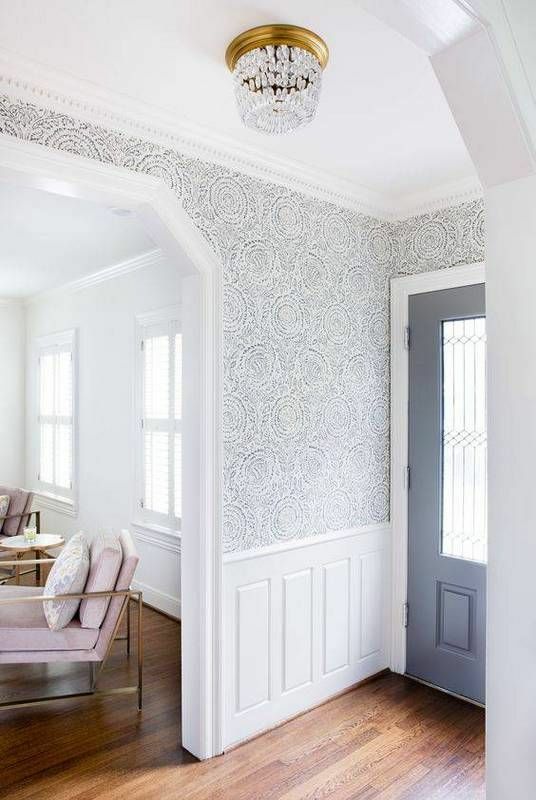 This is the little secret that can make wallpaper a little more complicated and expensive. Drywall skimming is not cheap, so keep that in mind before you decide to install wallpaper. Even after walls are ready for wallpaper based on their texture, they still need to be primed. So a wallpaper installer doesn't just come in and quickly throw wallpaper up. He has to first prime the walls. He does this so that the glue or adhesive being used for the wallpaper actually stays on top of the wall and doesn't get absorbed. The primer creates a top coat that prevents adhesive from getting sucked into the drywall causing there to be a bad adherence and, ultimately, peeling wallpaper. Which nobody wants! Once the walls are primed, a good wallpaper installer will use a good adhesive to adhere the wallpaper. The purpose of a good adhesive is two fold. One, a good adhesive will keep the wallpaper on the wall and prevent peeling which is a major deal! And two, a good adhesive will come off easily when removed right. The difficult thing about the way wallpaper used to be was the removal. Removal was messy and damaging to the drywall which made for a much bigger expense than anyone wanted. Good adhesives available now are water-based which means that a little steam should soften the adhesive and allow for the paper to be removed easily without much damage to the wall. We love wallpaper and, like we said before, we specify it all the time. However, we do NOT attempt to install wallpaper. We always higher a professional to install wallpaper and we actually recommend that you do too! It IS possible to install wallpaper yourself and, I guess, if you're really handy, you could attempt that. But we've also seen wallpaper installation go very wrong and we place a lot of value in the installers who do this for a living and do a great job! They are worth every penny they charge!